The GTA's move to overcome water crisis in the hills by digging borewells has met with opposition from environmentalists who say machines shouldn't drill the fragile land without a proper study. The Darjeeling district magistrate deputed a hydrogeologist under the state government to submit a report on three borewells dug by individuals in the Kalimpong municipality area. The hydrogeologist said the bore-wells had been dug without permission from appropriate authorities. The GTA had already identified 10 places to dig borewells and set in motion the administrative process for it. Mark Lyngdoh, a young entrepreneur, is believed to be the first person to dig a borewell in the hills. He successfully dug the borewell in the Hill Top locality in Kalimpong a couple of months back and over 6,000 litres of water could be pumped out a day. Samden Dukpa, executive director, public health engineering department, GTA, had said the borewell dug by Lyngdoh should be the first in the hills. "I am not aware of the existence of any other borewell in the hills," said Dukpa. One had never tried a bore-well before in the hills because of the terrain where water is hard to be found below the surface. After Lyngdoh, two more individuals dug borewells in Kalimpong which is located around 4,200ft. Dukpa today said world renowned hydrogeologist Dr. Ritesh Arya had identified 10 locations in the hills for digging borewells. "In February, we had engaged Dr Arya to carry out a preliminary survey on the feasibility of drilling borewells in the hills. Dr Arya has the experience of digging such wells successfully in high-altitude places like Ladakh, Leh, Shimla and Dharamsala. The (GTA) chief executive (Bimal Gurung) himself is very keen on the project. We intend to carry out pilot projects to drill borewells at 10 different sites in Darjeeling, Kurseong and Kalimpong and tenders will be floated soon," he said. Environmentalists and the general public, especially in Kalimpong, however, raised questions on drilling the fragile hills to extract water. The public's concern has found resonance with the district administration as well. Wing Commander (retd) Praful Rao, the president of Save The Hills, a Kalimpong-based NGO, said: "A proper survey needs to conducted before the mountains are drilled. The impact of drilling the fragile mountains needs to be studied, the type of aquifers beneath the surface needs to be understood, the quality of water needs to be tested and the amount of water that can be extracted needs to be carefully analysed before such an adventure can be allowed." He went on: "The water scarcity in the hills is more about mismanagement and drilling should be the last resort. There are also enough research materials that show that drilling of fragile mountains is not among the best options. There were instances when digging of deep wells had dried up springs in the mountain areas." 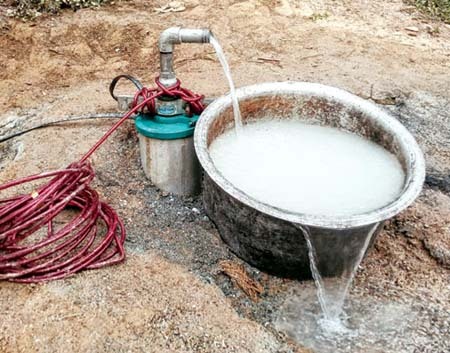 Asked about the issue, Anurag Srivastava, the Darjeeling district magistrate, said he had asked Soumit Chatterjee, a hydrogeologist in the state water investigation department, to submit a report on the borewells in Kalimpong. Chatterjee who visited Kalimpong yesterday, said the borewells had been dug without permission. "All borewells dug in the hills are illegal. Permission has to be obtained from the district level ground water resources development authority and the state level ground water resources development authority for digging borewells under the West Bengal Groundwater Resources (Management, Control and Regulation) Act, 2005." The hydrogeologist said the district level authority would grant permission to extract water till 50 cubic meters per hour. "Beyond the 50 cubic meter mark, permission has to be sought from the state authority," he said. The official is expected to submit his report to the district magistrate soon. "We were not aware that drilling was taking place in the hills. Apart from merely looking into administrative technicalities, one has to take into account what the impact would be on a young mountain like the Himalayas if thousands of deep wells are dug," said Chatterjee. Zion Lepcha, the vice-chairman of Kalimpong municipality, said: "After concerns were raised by a section of the society, we have informally asked those who have dug borewells to stop extracting water until we get experts to carry out a scientific study of our area." A GTA official, who didn't want to be named, said the hill body was not aware of the rules restricting the digging of borewells.